The Red-Shouldered Blackbird, Agelaius assimilis, was previously considered to be a Red-Winged Blackbird, Agelaius phoenicus. These two species were split into phoenicus and assimilis in 1850 (Alfons). These birds are placed into two separate species due to female dimorphism and several other small morphological differences (Barker, Vandergon, and Lanyon). 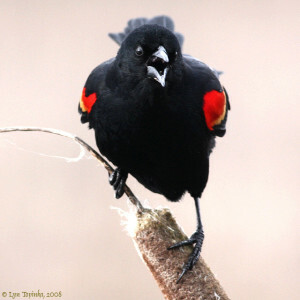 The Red-Shouldered Blackbird is in the Icteridae family (Alfons). It is called “Chirriador” meaning “creaker” in Cuba. A. assimilis is also called “Mayito de Cienaga” which means “marsh blackbird” (Garrrido and Kirkconnell). Some consider A. assimilis to be an unusual subspecies of the very common A. phoenicus, but very little is specifically known about A. assimilis (Neotropical Birds). A. assimilis tends to be monogamous, a trait that differs from A. phoenicus which is usually polygynous (Barker, Vandergon, and Lanyon). A. assimilis is also endemic to specific parts of Cuba. It is found in western Cuba and sometimes in Central Cuba primarily in the marshes and swamp lands. A. phoenicus, on the other hand is one of the most common birds of North America and is found virtually anywhere in North America where swamps and marshy areas exist (Garrrido and Kirkconnell). A. assimilis prefers forests and marshes (Bird Life International) and uses water plants and dry grasses for nesting materials (Kirwan). A. assimilis feeds within its habitat (Website of Everything). 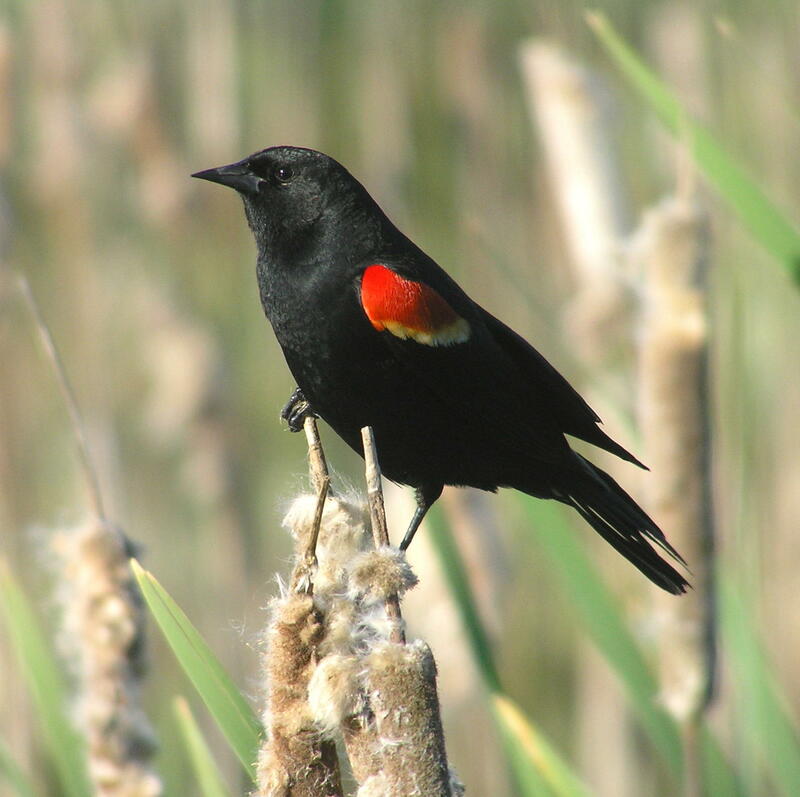 Red-shouldered blackbirds have less of a gender size dimorphism than red-winged blackbirds (Barker). A. assimilis is also smaller in average than A. phoenicus. A. assimilis ranges from 19-23cm (Raffaele). The males are usually 22cm and 54.4g, while females are usually 20cm and 41.8g (Fraga). Also, In A. phoenicus, the males are all black with scarlet lesser wing-coverts while the females are brownish with mixtures of white and black. In A. assimilis the males strongly resemble A. phoenicus while the females are very different. Female A. assimilis from Cuba and the Isle of Pines are completely black. The red-shouldered blackbird is more similar to A. xanthomus and A. humeralis than to A. phoenicus (Barker). A. assimilis also differs from A. phoenicus in vocal and social behaviors (Garrido and Kirkconnell, and Roman Company). The first year A. assimilis males resemble the females because they are all black with only a small brownish patch on their shoulder. Both sexes of A. assimilis have square tails with slightly pointed feather tips (Garrrido and Kirkconnell).A. assimilis’s similar species include A. phoenicus, A. humeralis (Tawny- shouldered blackbird) and D. atroviolacea (Cuban Blackbird) (Garrrido and Kirkconnell). A. assimilis is considered rare but can be locally common in western Cuba and have can small populations in central Cuba. A. assimilis is not as common in any other part of Cuba. They are extremely social and get along well with other bird species. A. assimilis has two subspecies: A. assimilis assimilis and A. a. subniger (Oiseaux). They form large. 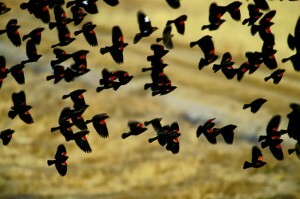 mixed species flocks with the Cuban Blackbird and the Tawny-Shouldered Blackbird. These extensive flocks are restricted to the non-breeding season due to territoriality and the protection of young birds still in the nest. A. assimilis usually lays three to four eggs pale bluish-white eggs. These eggs are heavily spotted with reddish brown and pale purple scrawls. Their nesting period is from May to August (Garrrido and Kirkconnell). The red-shouldered blackbird and the Tawny shouldered blackbirds have been studied very little but it is known that both bird species do not migrate and are permanent residents on their Caribbean islands (Whittingham: Breeding Behavior). A. assimilis has a harsh, creaking-like call that has been noted as “not shrill” in tone. Yet their song is non-melodic (Raffaele). Their song differs from the male specific song of A. phoenicus because in A. assimilis both genders vocalize and sing a “duetting” song (Barker). The adult male A. assimilis resembles the males of a blackbird species from the Yucatan, but the females are quite unique since they have all black coloring (Cassin). Recent evidence points to the fact that female ornaments have evolved independently of male showiness (Amundsen). Most Agelaius species exhibit similar polygynous breeding behaviors, yet, as previously mentioned, A. assimilis demonstrates monogynous breeding behavior. Male birds of most species have very complex songs, yet it seems that in the tropics females also develop complex songs. In A. assimilis, females sing very similar songs back to their male partners. A possible explanation for this bi-gender singing is its impact on territoriality . A. assimilis uses this method of “duetting” to define and protect their territory year round. Other explanations include a high level of competition between females for mates (Price). Female singing, then, brings potential mate attention to the individual. Yet another explanation for this phenomenon is that the duetting songs help to prevent any potential mate stealing by un-mated individuals. This duetting, then, may signal both genders commitment to their partner. It has been previously believed that evolutionary changes occurred more drastically in males than in females, yet in A. assimilis females color has changed much more than in males. Females are possibly evolving more rapidly and may end up looking like males. The female song in red-shouldered blackbirds represents a significant reduction in the sexual dimorphism of this species (Price: Rethinking). “Agelaius Assimilis.” Agelaius Assimilis (Red-shouldered Blackbird). BirdLife International, 2012. Web. 12 Oct. 2015. Alfons, Jaramillo. “Species.” Red-shouldered Blackbird (Agelaius assimilis). Bird Life International, 2015. Web. 12 Oct. 2015. Barker, F. Keith, Arion J. Vandergon, and Scott M. Lanyon. “species status of the red-shouldered blackbird (agelaius assimilis): implications for ecological, morphological, and behavioral evolution in agelaius.” The Auk, 2008. Google Scholar. Web. Bond, James. Birds of the West Indies. Boston: Houghton-Mifflin, 1971. 220.Print. Cassin, J. “A Study of the Icteridae.” Academy of Natural Sciences. 10-25. JSTOR Web. 12 Oct. 2015. Fraga, R. (2011). Red-shouldered Blackbird (Agelaius assimilis). In: del Hoyo, J., Elliott, A., Sargatal, J., Christie, D.A. & de Juana, E. (eds.) (2014). Handbook of the Birds of the World Alive. Lynx Edicions, Barcelona. Garrido, Orlando H., Arturo Kirkconnell, and Román Compañy. Aves De Cuba. Ithaca: Comstock Associates, 2011. 218. Print. Garrido, O. and Arturo Kirkconnell. 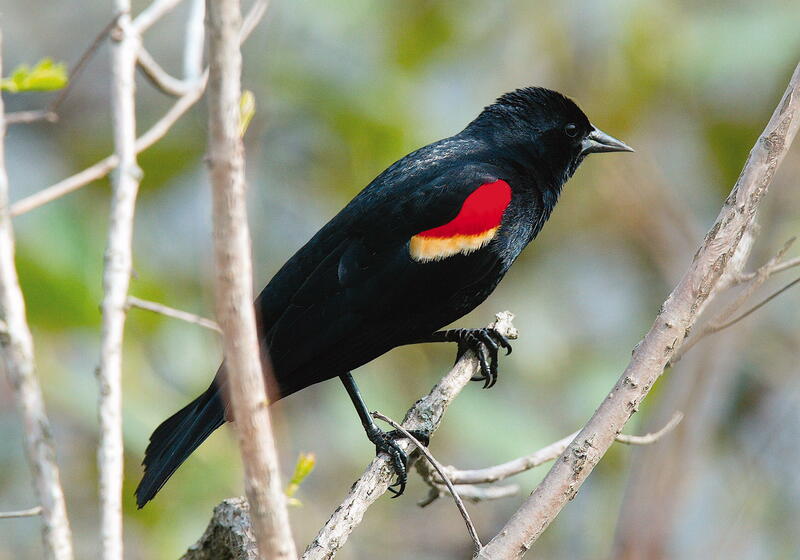 “Taxonomic Status of the Cuban Form of the Red-Winged Blackbird.” The Wilson Bulletin. Vol. 108, No. 2 (Jun., 1996), pp. 372-374. JSTOR. Web. 12 Oct 2015. Hall, M. “A Review of Hypotheses for the Functions of Avian Duetting.” Behavioral Ecology and Sociobiology. March 2004, Volume 55, Issue 5, pp 415-430. Google Scholar. Web. 12 Oct. 2015. Kirwan, Guy M., Arturo Kirkconnell, and G. Michael. Flieg. A Birdwatchers’ Guide to Cuba, Jamaica, Hispaniola, Puerto Rico and the Caymans. Cley next the Sea, Norfolk:Prion, 2010. Print. Lowther, P. E., R. Fraga, T. S. Schulenberg, and S. M. Lanyon. “Nomenclatural Solution for a Polyphyletic Agelaius.” British Ornithologists’ Club, 2003. Google Scholar.Web. 29 Sept. 2015. Price, J. J. and Eaton, M. D. (2014), reconstructing the evolution of sexual dichromatism: cur rent color diversity does not reflect past rates of male and female change. Evolution, 68: 2026–2037. Google Scholar. Web. 12 Oct. 2015. Price, J. Jordan. “Behavioral Ecology.” Evolution and Life-history Correlates of Female Song in the New World Blackbirds. Oxford Journals, 2009. 967-977. Google Scholar. Web. 29 Sept. 2015. Price, J. Jordan. “Rethinking Our Assumptions about the Evolution of Bird Song and Other Sexually Dimorphic Signals.” Frontiers. 14 Apr. 2015. Google Scholar. Web. 29 Sept. 2015. Raffaele, Herbert A., James Wiley, Orlando Garrido, Allan Keith, and Janis Raffaele. Birds of the West Indies. Princeton: Princeton UP, 2003. 186. Print. “Red-shouldered Blackbird (Agelaius Assimilis). Neotropical Birds.” Ed. T. S. Shulenberg. Cornell Lab of Ornithology, 2010. Web. 12 Oct. 2015. “Red-shouldered Blackbird.” Geographic Range. Oiseaux, n.d. Web. 12 Oct. 2015. “Red-shouldered Blackbird.” Red-shouldered Blackbird. Website of Everything, 2010. Web. 12 Oct. 2015. Whittingham, L. Arturo Kirkconnell and Laurene M. Ratcliffe. “Breeding Behavior, Social Organization and Morphology of Red-Shouldered (Agelaius assimilis) and Tawny-Shouldered (A. humeralis) Blackbirds.” The Condor. Vol. 98, No. 4 (Nov., 1996), pp. 832-836. JSTOR. Web. 12 Oct. 2015.